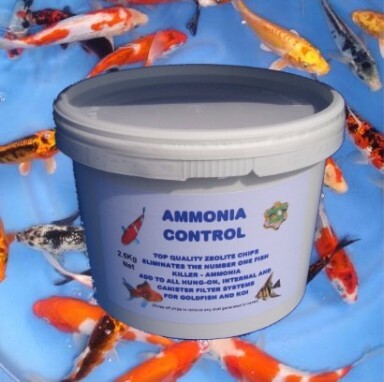 Use Ammonia Control Zeolite to remove harmful ammonia from koi ponds, fish tanks, fish transport trucks, etc. Ammonia is the by-product of fish waste, uneaten food, and at high levels is toxic to fish. Zeolite rocks are like a sponge and magnet which attracts as well as absorbing harmful ammonia before it can cause fish loss. The Zeolite chunks can be cleaned or regenerated by soaking them in salt water and re-used again. One pound of Zeolite will remove approximately 3 ppm ammonia from 100 gallons of water.